The most obvious comparison to this book is Andy Weir's The Martian--and I think Weir's book suffers more than a little in the comparison. This book is a lean, mean, hard SF thriller that has more plausible science, and is a ripping good story to boot. The Mars Endeavour colonizing mission is set in the near future. 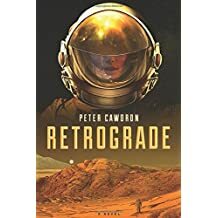 No specific dates are given, but the afterword posits that Cawdron's scientific extrapolations might be possible sometime in the 2050's (assuming climate change hasn't drowned half the world and destroyed society by then). The colony's four habitats (Russian, Chinese, American and Euroasian) are built in underground lava tubes with an interconnecting "hub" where crops are grown. We hit the ground running in the first chapter, when a somewhat drunken celebration in the Chinese habitat is interrupted by the horrifying news that there has been a nuclear exchange back on Earth. From there, this becomes a mystery (who has done this? and why?) evolving into an oft-grim survival story (the delicate knife's edge of living on Mars is not sugarcoated) and finally a race-against-the-clock thriller. The author has done an incredible amount of research to support his tale, and it shows. Yet he doesn't infodump, but works in the necessary information in an engaging fashion that doesn't detract from the pace and urgency of his story. The only quibble I have is the characterizations are a bit superficial at times. They're not bad, certainly, just...adequate. I think that's a result of the book's fast pace and its relative shortness (237 pp). I don't often wish books could be longer, but I do with this one. I would have loved more chapters exploring the character relationships and the science of the colony. Nevertheless, this is a rip-roaring, thoroughly enjoyable story.